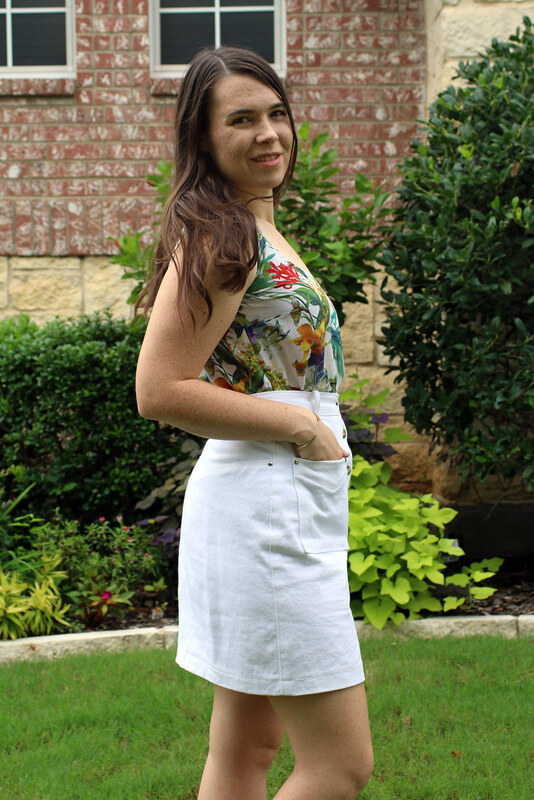 This skirt is one of my favorite makes so far for my #SummerSewing wardrobe. 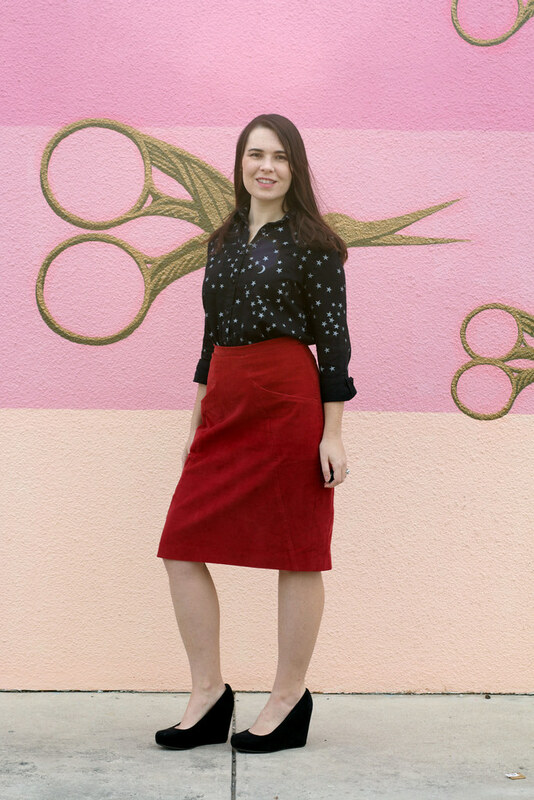 I wanted a simple straight skirt so I went with the Seamwork Leonora pattern. 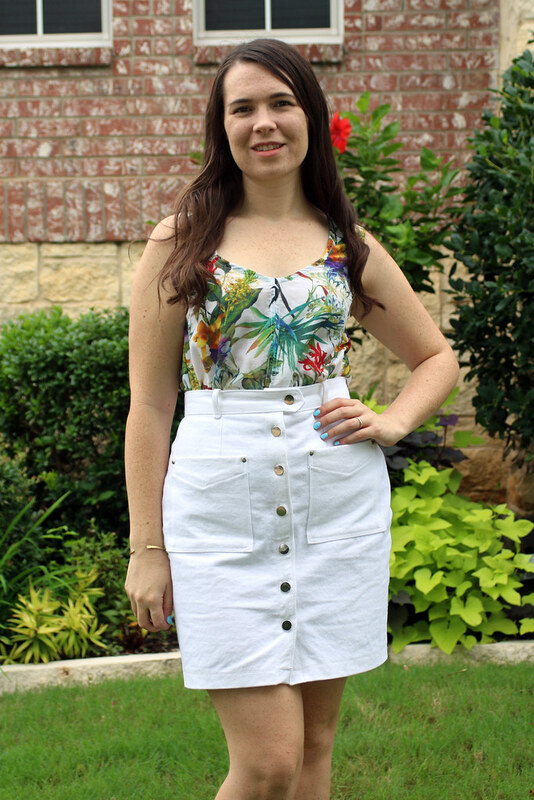 I bought this 100% cotton bull denim from Joann Fabrics. 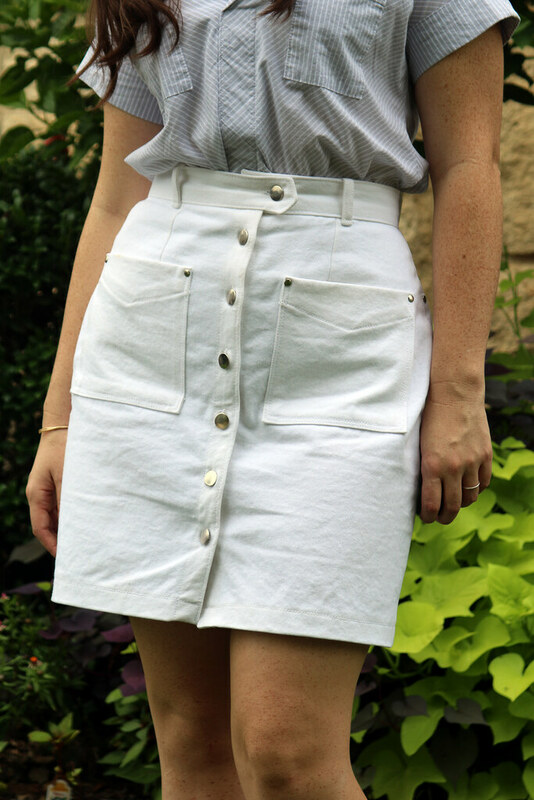 For a skirt like this, I didn’t want a stretch denim. I bought the buttons and round rivets from WAWAK. The pattern was pretty good and easy to follow. I’m pretty pear shaped so I had to grade up two sizes in the hips. I also needed a severe swayback adjustment. Normally I would scoop out the back waistline to make that adjustment. This time I trimmed the bottom edge of the yoke along the yoke seam. 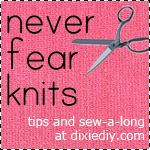 I ended up cutting out about 1″ in length at the center back along that seam! In the end the I think the fit looks pretty good, although I could probably steam the side seams a bit more. The only mistake I made was somehow cutting the belt loops too short. They probably need an extra half inch in length. 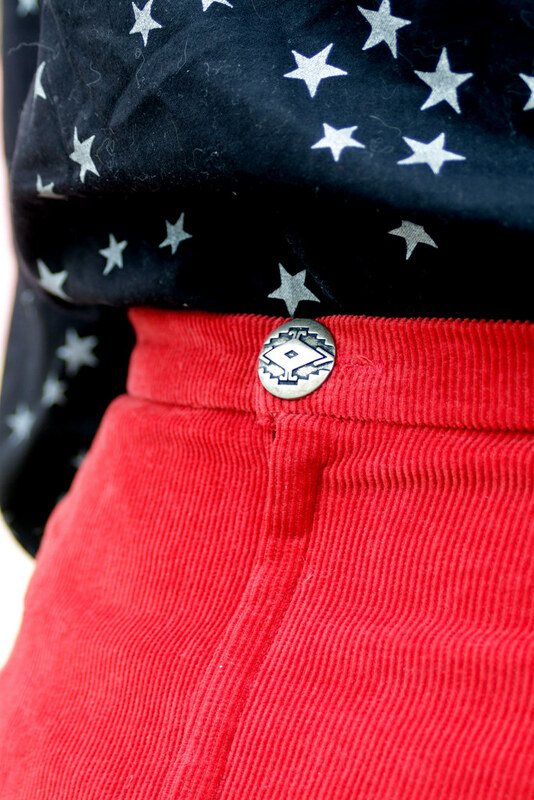 Along the bottom side, the loops shouldn’t be attached so close to the waistband. There ought to be a little extra space between where the loops attach and the waistband seam to help accommodate a wide belt. I doubt I’ll wear a belt with this skirt but the short loops did create a problem with the rivets. 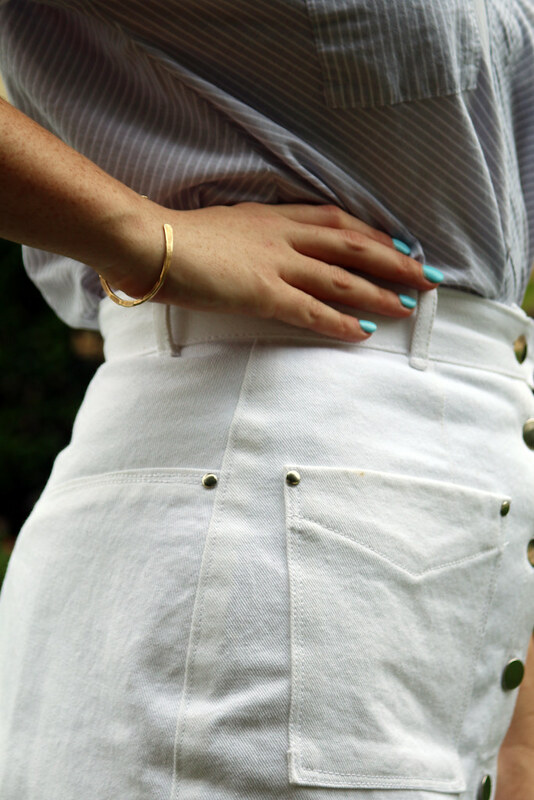 The pattern is designed to use rivets to attach the bottom of each belt loop to the skirt but because my loops were too short, I had to attach them with stitching. This resulted in too much bulk for the rivets to stick through. Despite that minor snafu, this skirt is a definite winner. I’m glad I took the extra time and money to add the rivets on the pockets and sides. And even though the fabric is white, it hasn’t gotten very dirty, even while cooking! It’s been quite a useful bottom layer in my wardrobe so far. 5 out of 5! Poor Miette, this skirt seemed like it was never meant to be. Don’t get me wrong – the pattern is well drafted with good instructions but I faced a few challenges in my sewing journey. 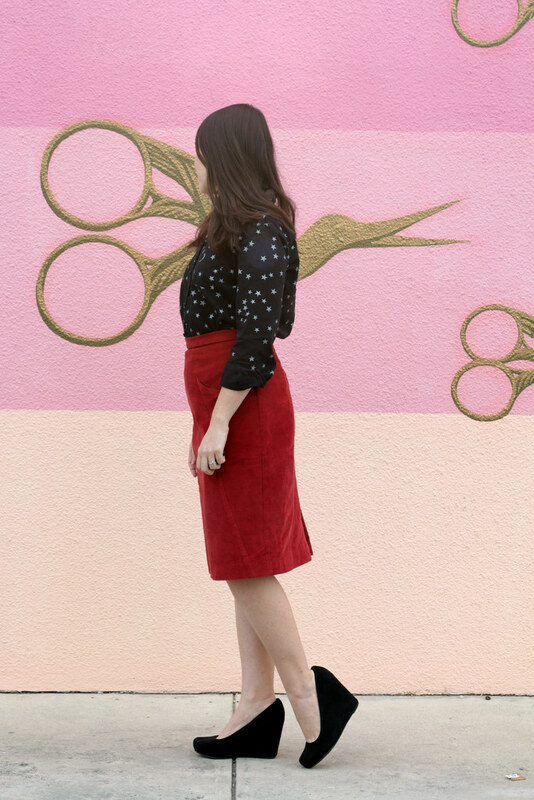 This is the Miette Skirt by Tilly and the Buttons. I sewed this skirt as a sample for a possible class. I’m always looking for smart, easy, beginner friendly patterns for teaching opportunities. 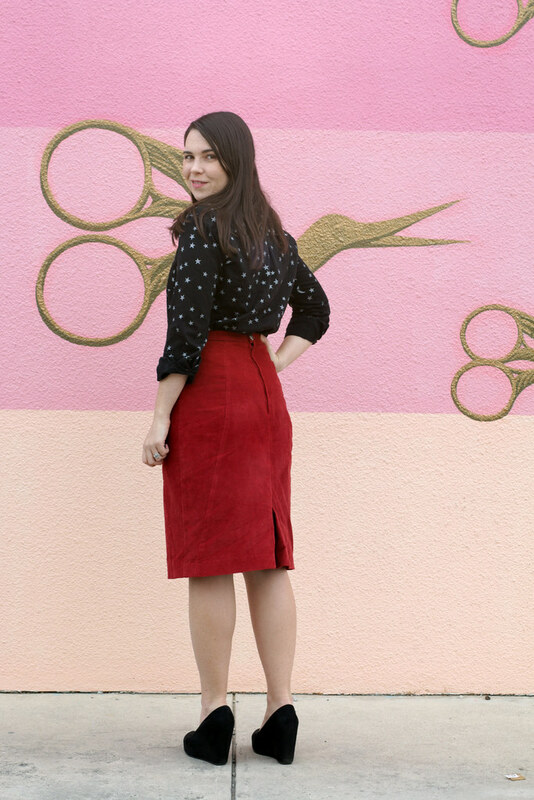 But right after I finished this skirt I learned Tilly & the Buttons is discontinuing the paper version of this pattern. Sadly, no printed pattern means no class for me. The fabric is a Japanese cotton/linen blend from The Cloth Pocket (no longer available). It was a good weight for this pattern – a medium thickness but not so heavy that you can’t slip the ties through the waistband. Unfortunately, this fabric may not have been the best choice for this pattern because of the print. While it seems striped, it’s NOT a perfect stripe! Ugh, I hate “almost” stripes. If you look closely at these pics you can see how the fabric slopes downward from left to right in the front. This made matching the center front difficult, especially with the pockets. I had to adjust the pockets a bit to get the stripes and points to match properly. I didn’t even bother trying to get the sides to match. Since I’m pear shaped I graded from one size at the waist to a larger size at the hips. Normally for an A-shaped skirt, the hip size doesn’t matter as much but I wanted to play it safe. I think that was a good choice but I believe I’m also in desperate need of a sway back adjustment. 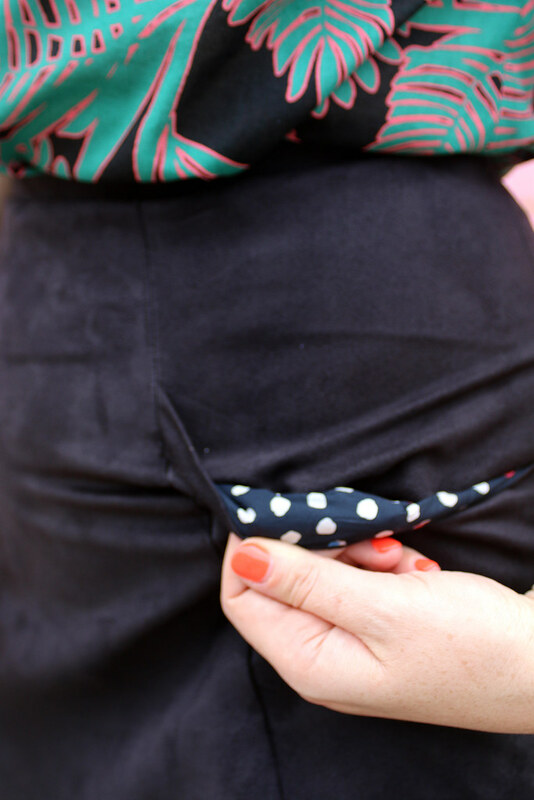 You can see that the fabric pulls at an angle at the back waistband area. The only way to avoid that pulling is to loosen the waist ties but then the waist is way too big. Maybe with my wide hips I ought to have gone down a size in the waist and up another size in the hips (plus a sway back fix as well)? I don’t think this skirt turned out badly, it just needs some tweaks and the right fabric to make it great. I ought to give Miette another try but these few issues really got me down about sewing it again. I guess it’ll sit on the shelf for a while before I revisit it. On the upside – coral pink and royal blue is one of my favorite color combos these days so that’s a win, right? This is my second version of the BluePrints for Sewing A-Frame skirt. This fabric is black so it may be hard to see the seam lines. You can click on the images to zoom in. I’ve now taught this pattern as a class a few times and I’m always impressed at how well it fits everyone who has made it. It helps that the pattern includes fitting instructions. 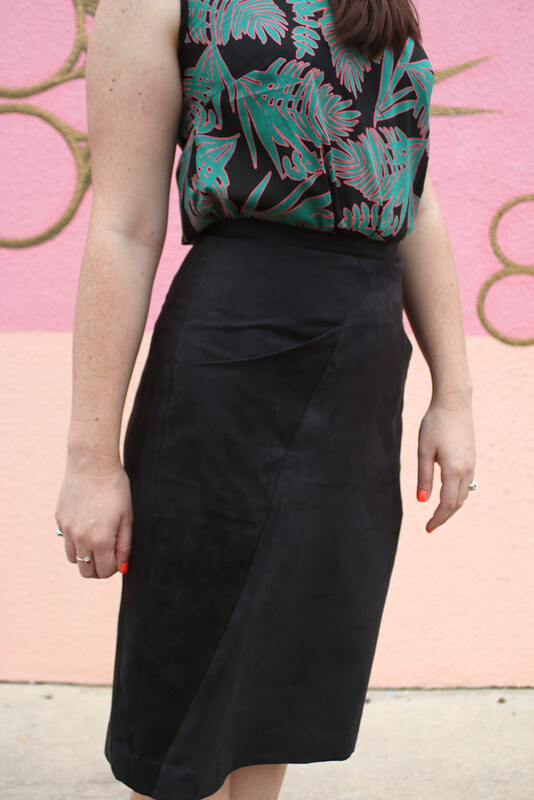 For this skirt, I again made the pencil skirt version, this time in a faux suede. It’s been several years since I’ve sewn faux suede but this fabric from The Cloth Pocket washes very well and was easy to work with. It’s obviously thinner than the corduroy that I used last time so it tends to wrinkle and show lines where I tuck my shirt into it. Gotta work on that. I was concerned that this fabric was a little thin for this project and bounced around the idea of interlining it with something stronger. I’m glad I didn’t do that to the body of the skirt because I liked the result but I should have used a thicker interfacing in the waistband. It has a tendency to roll over time. Not sure if I want to take the waistband off and re-stabilize it. Not sure if that’s even possible now that I’ve already added the buttonhole in back. I lined the pockets with the same scraps as my last A-Frame because I had enough fabric left and that fabric is so finely woven and thin I knew it wouldn’t add bulk. I still love that lapped zipper in the back. It’s a nice touch you don’t often find in modern clothing. 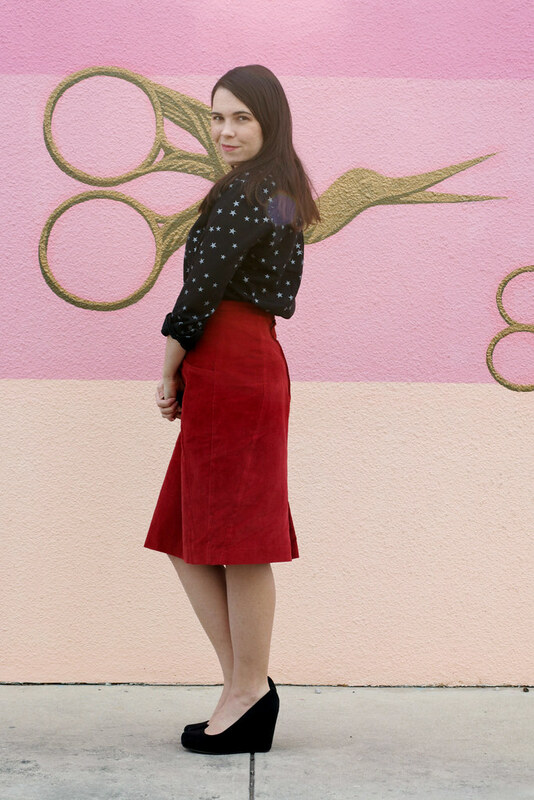 I hand hemmed the skirt but with this suede, you can still kind of see the line of stitching. It’s less noticeable without the camera flash. I sewed the same size as my first A-Frame and it fits well everywhere… except that darn waistband. It’s just a little too snug. Just goes to show that two different fabrics will not behave the same way with the same pattern. My apologies for the high number of photographs. What can I say? 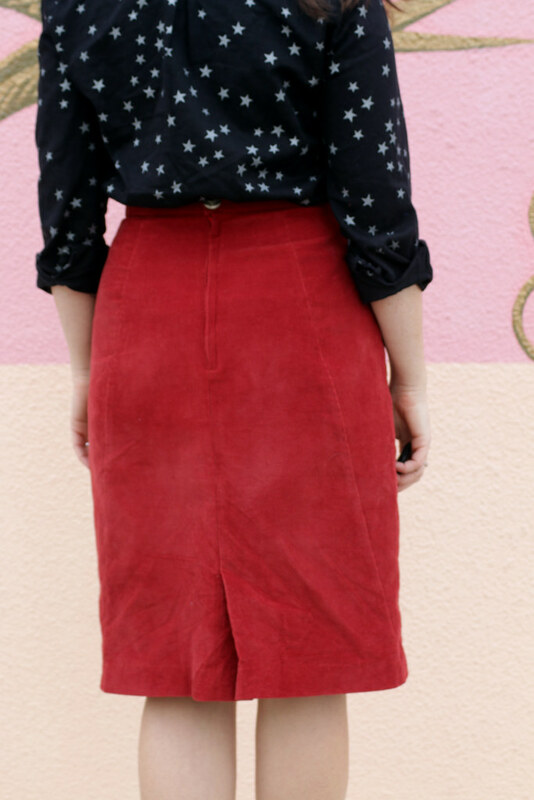 I love this skirt so much and it looks so good in every single picture that it’s difficult to choose which to show. 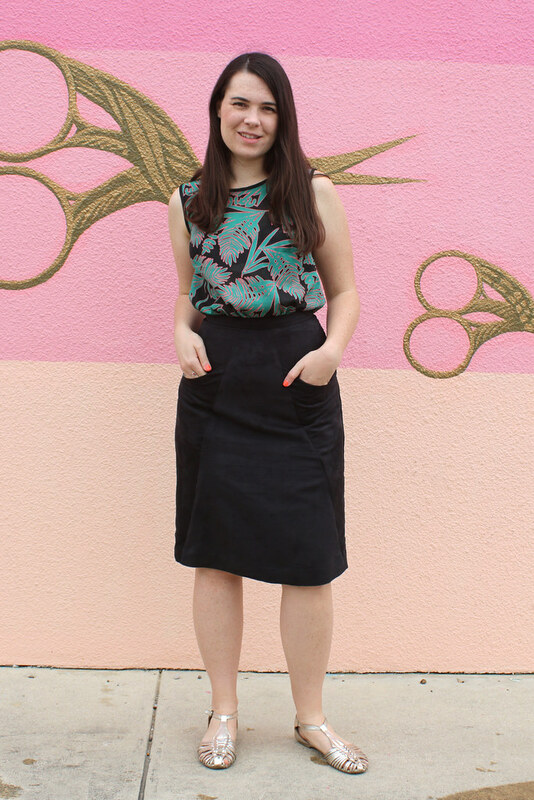 This is the A-Frame skirt from Blueprints for Sewing, view A – the pencil skirt version. The fabric is red corduroy from The Cloth Pocket (beware, the fabric is a more muted color in real life than in these photos). It’s a great medium weight – not too thick, which is important when seam allowances get bulky. I used a thin leftover cotton for the pocket lining which also helped reduce bulk. The skirt came together fast and the instructions were clear. The pattern also includes several fitting tips, which is always nice. And I generally liked the techniques, order of assembly, and little details included in the instructions which helped to create a professional finished project. You get the feeling that the drafter knows what she’s doing. I cut a size B in the waist and graded to a D in the hips. It fit great! The only change I made was to slice off about 1/2″ at the center back grading to nothing at the side seams. I maybe could have cut a bit more. This need was likely due to my sway back which made the skirt sit higher on my back waist than in the front. One thing that is interesting about this design is that the kickpleat isn’t “open.” It’s stitched together then folded over. It’s more like a real pleat and less like a slit. This might be ok on a different fabric but looking at these pictures, I think unless I press the kickpleat down quite well, it has a tendency to flop out slightly. It’s not a big deal. What I can do next time is just leave it open and fold under my seam allowances for a smooth finish. I appreciated that the pattern included instruction for a lapped zip, invisible zip, as well as a handpicked zip. I chose a lapped as I worried the corduroy wouldn’t handle an invisible very well and lapped zips always look extra professional. I used a button from my stash. I always like opportunities to show off a unique button. I love the angular style lines and the seams curve really well over my back half which gives it more of a “pencil” shape than a standard straight skirt. 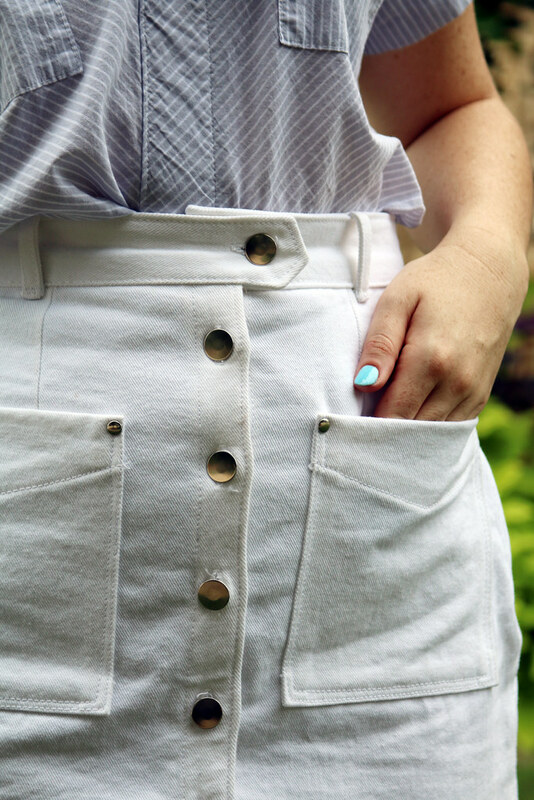 The pockets are just the right depth to hold a cellphone without it falling out. 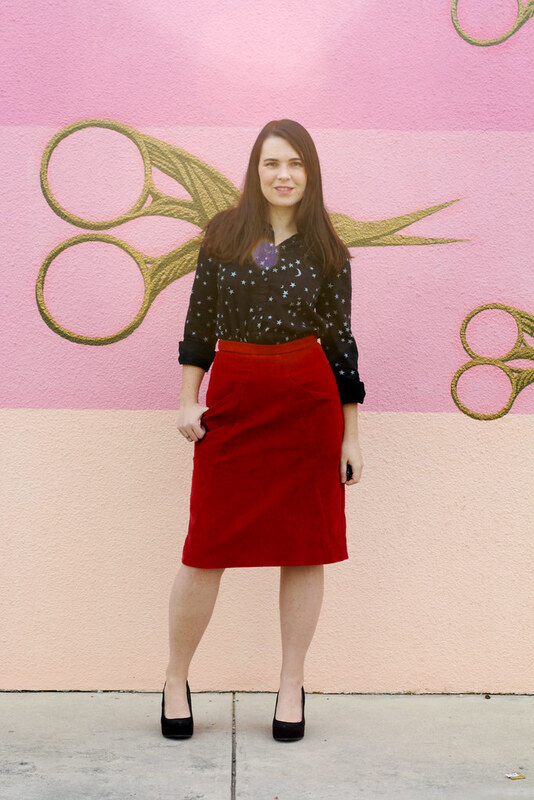 I can’t wait to sew this skirt again! Just gotta get the right fabric. I think I even want to shorten it to above the knee and make it mini-length. That way I can ditch the need for the kickpleat, too. 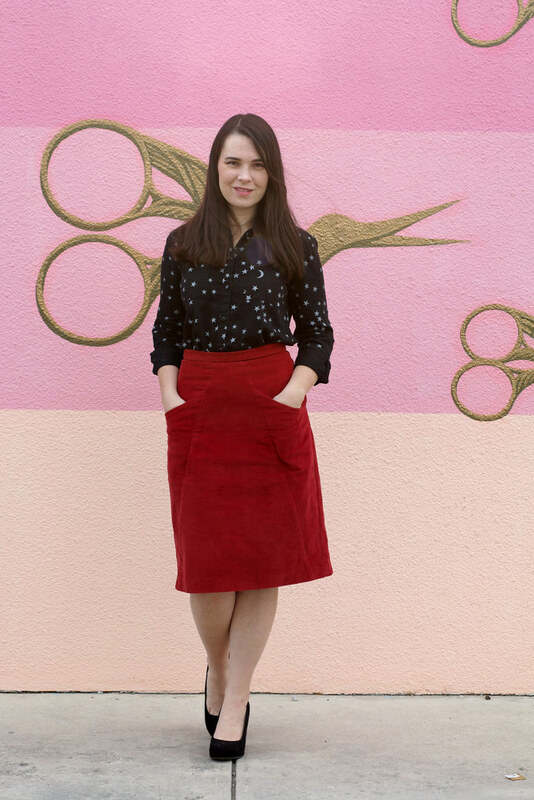 BTW, if you’re in Austin I’m teaching a couple classes on this skirt so if you want to make one for yourself, learn new techniques, and sew with some new friends check out the schedule!